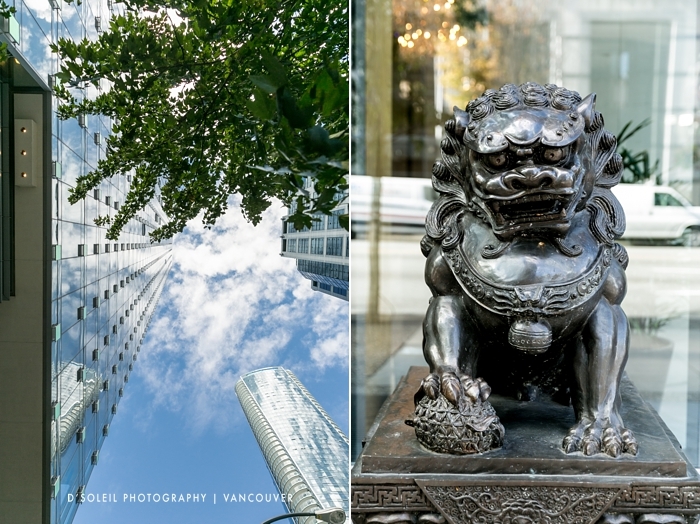 Na + Jason celebrated their Shangri-La Hotel wedding on a beautiful early September day this year. 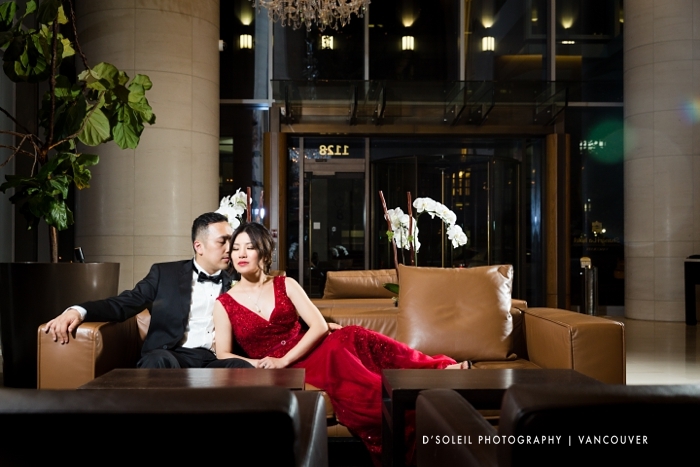 They planned their wedding with one venue in mind, so almost everything happened at the hotel. 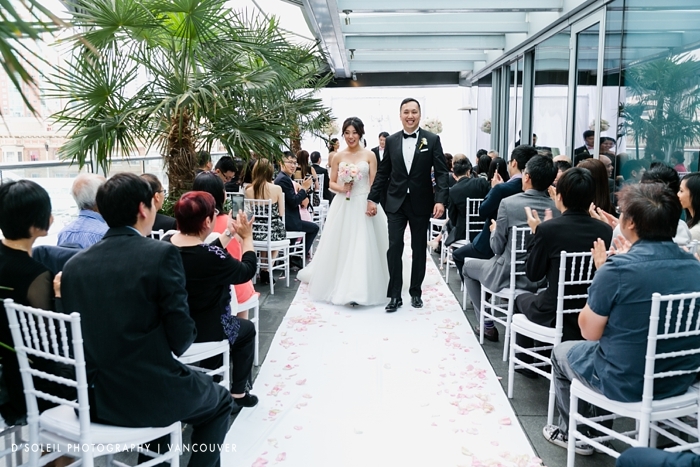 We started with wedding photos of the bride and groom and their wedding party at Stanley Park, which is just a short drive away from Shangri-La Hotel in Vancouver. 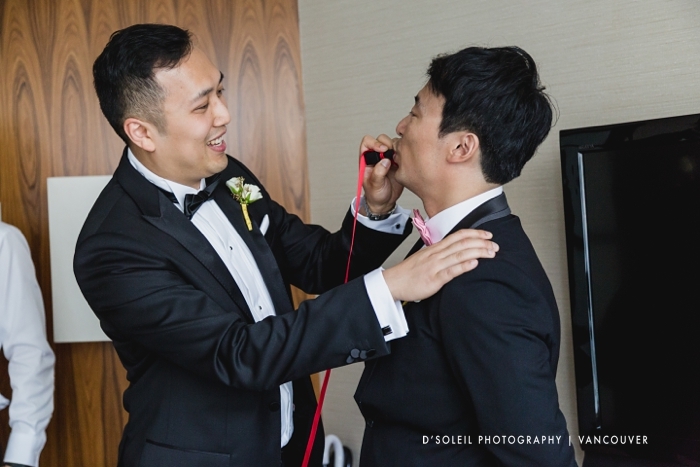 As with many Chinese weddings, the bridesmaids played door games with the groom, a ritual which had the groom and groomsmen complete a number of “tasks” before being allowed to see the bride. 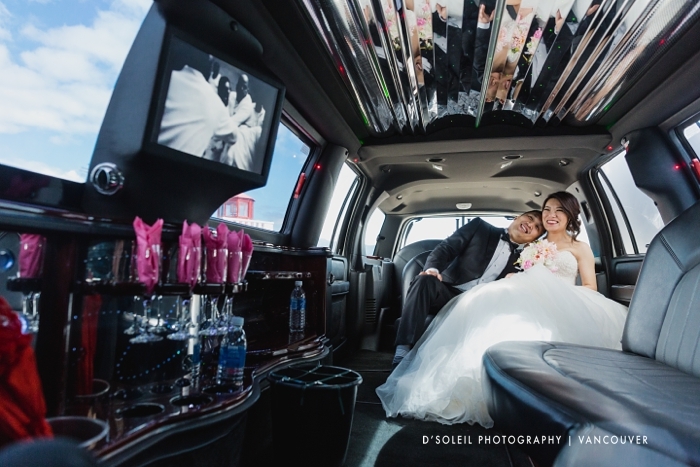 The bride watched the “games” on her iPhone from the comfort of a luxurious bridal room at the Shangri-La Hotel. 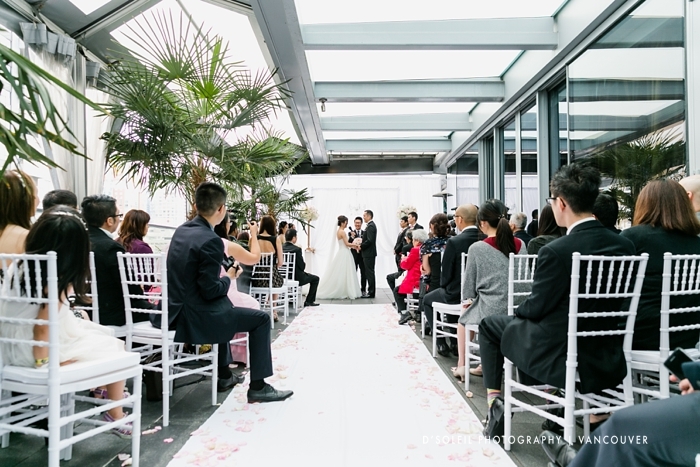 Another common ritual for Chinese weddings is the tea ceremony. 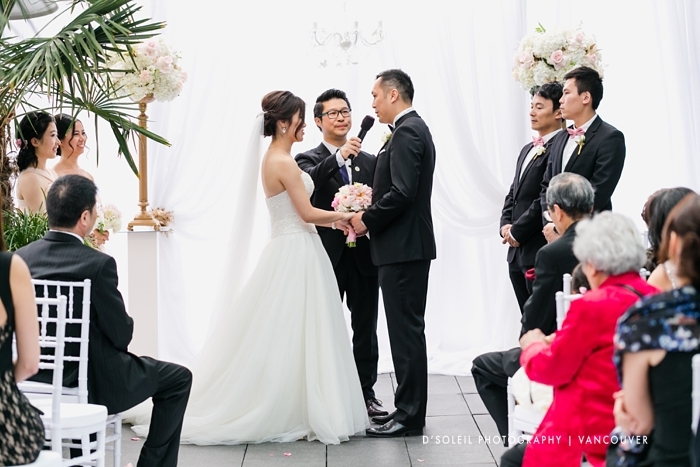 This is a ceremony where the bride and groom pay their respects to family members by serving tea. 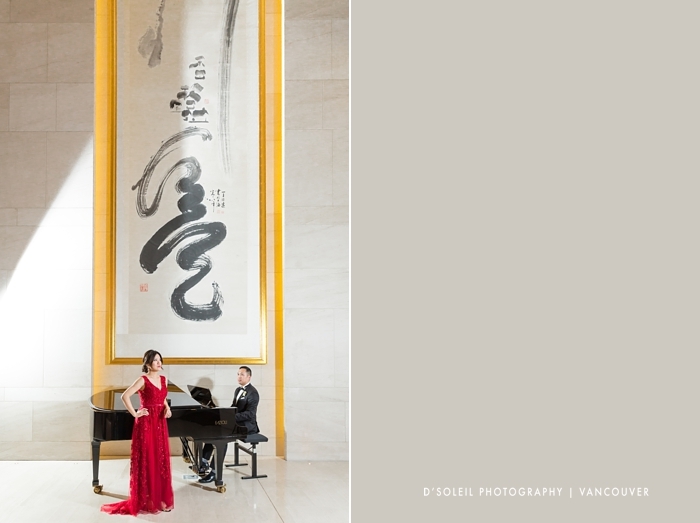 In return, they often receive “red packets” and jewelry. 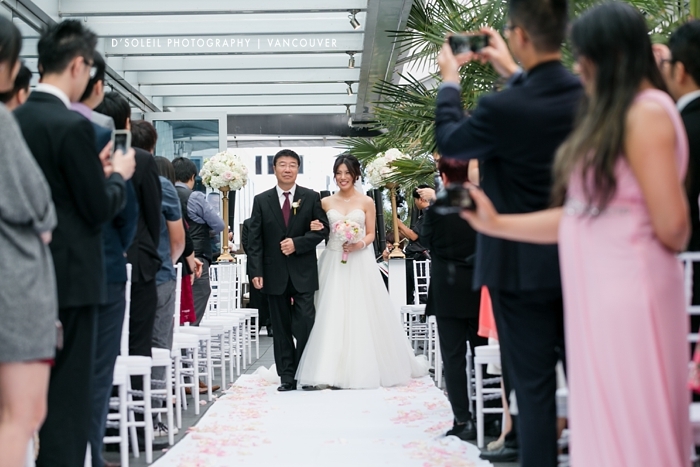 Following the tea ceremony, Na returned to the bridal room to change into her wedding dress with the help of her mom and bridesmaids. 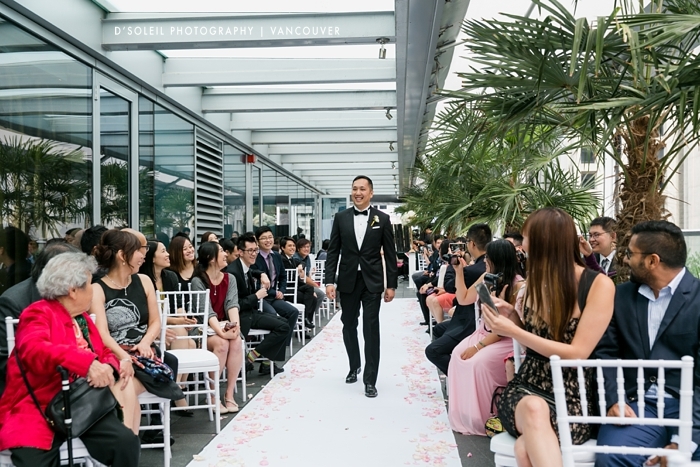 The Shangri-La wedding ceremony usually takes place right outside the hotel’s ballroom venue space. It is a long semi-covered patio with enough space for about 3 chair on either side. 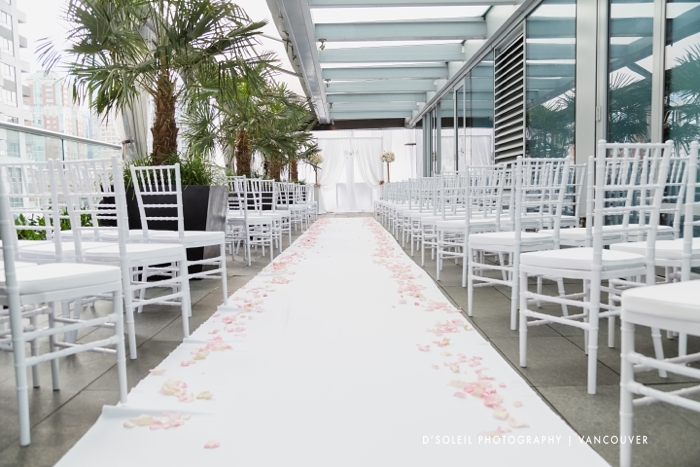 If you love long aisles, this is the hotel wedding venue for you. 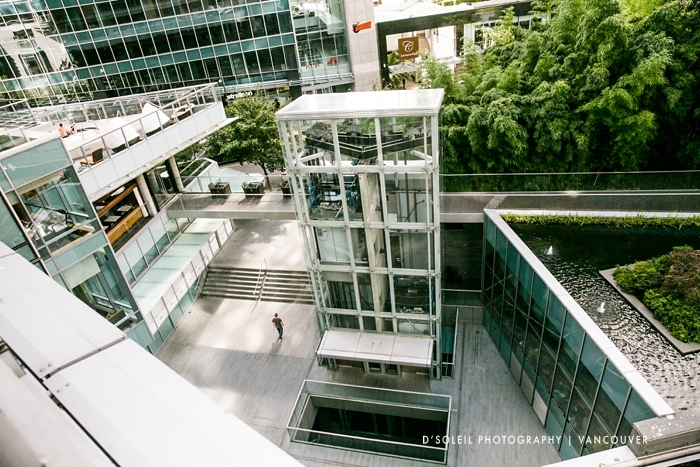 It features palm trees, and overlooks Alberni St. with a modern metropolitan feel. 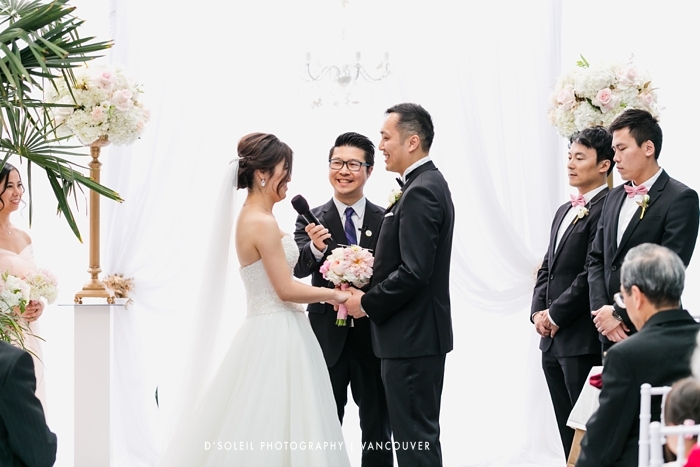 We took wedding photos at Stanley Park. One of our favourite locations is the lighthouse. 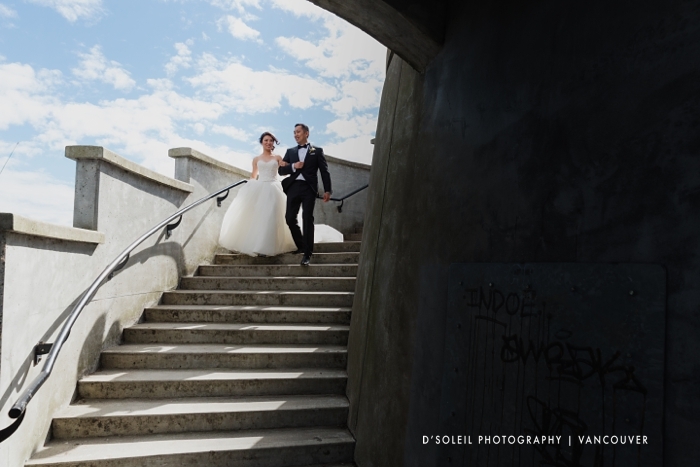 Although it is often a busy tourist location, we are always able to find moments where there are no people around to take the best wedding photos for our clients. 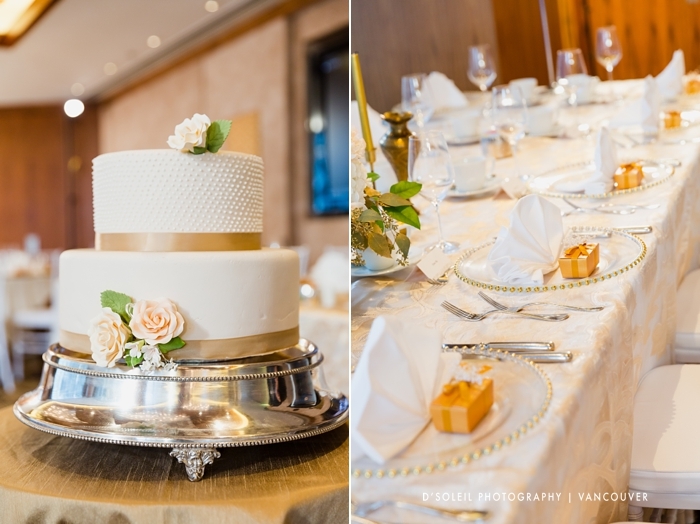 The loves the gold and white tones on display for Na and Jason’s wedding reception at the Shangri-La Hotel. 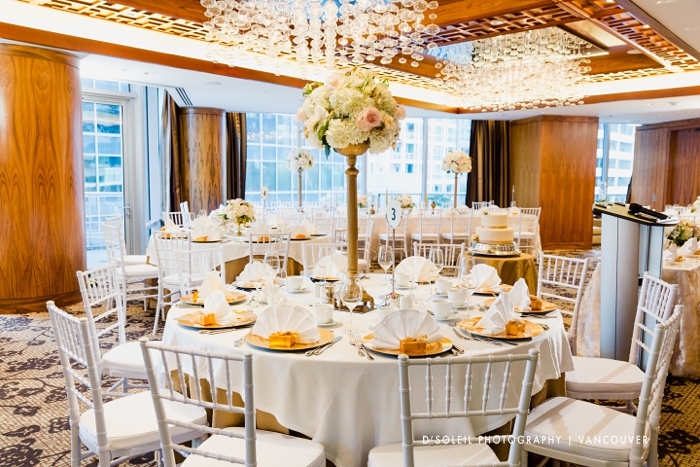 The tall floral centerpieces really added height to the overall decor. 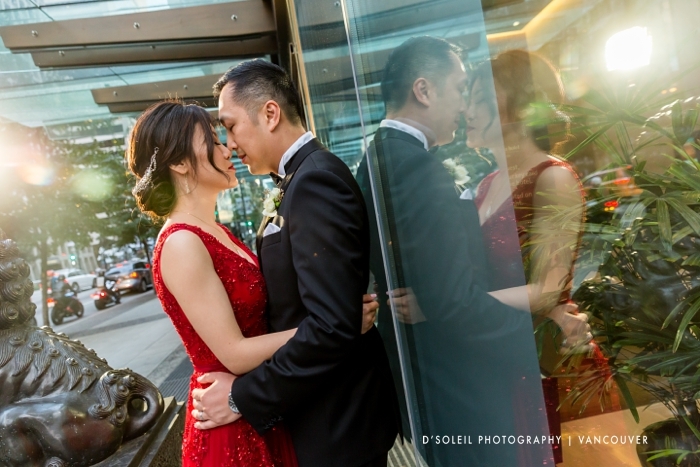 In the evening, we took photos outdoors and in the lobby of the Shangri-La Hotel, which turned out to be a beautiful capstone to end a wonder day for Na and Jason’s Shangri-La Hotel wedding. Thanks for sharing! 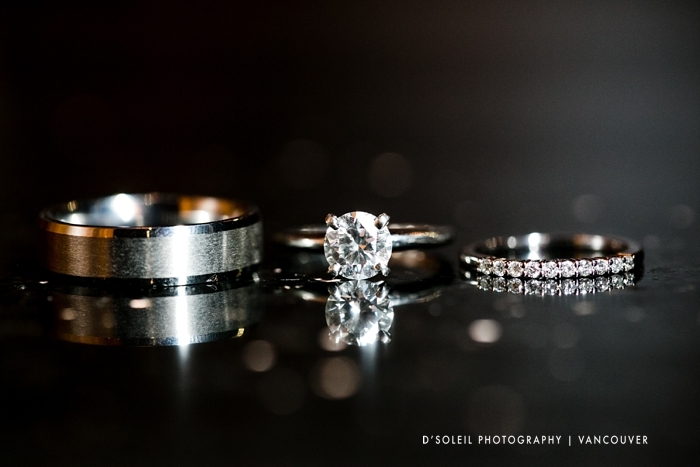 I enjoyed all the glitz and glam this wedding entailed. 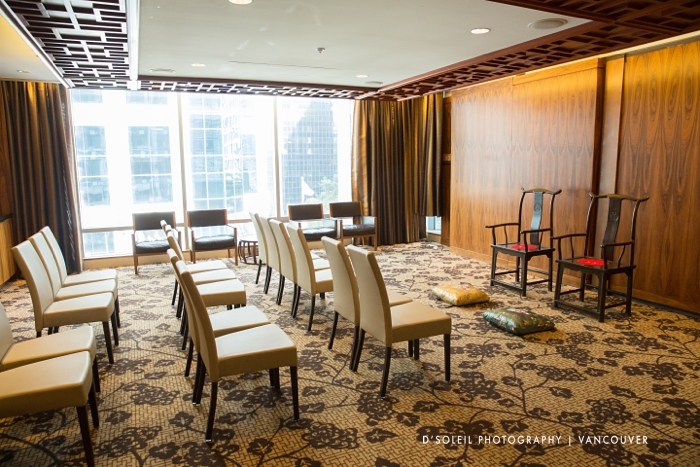 It was also interesting to read about the Chinese rituals that took place before the wedding ceremony. Na was wearing a beautiful wedding dress. 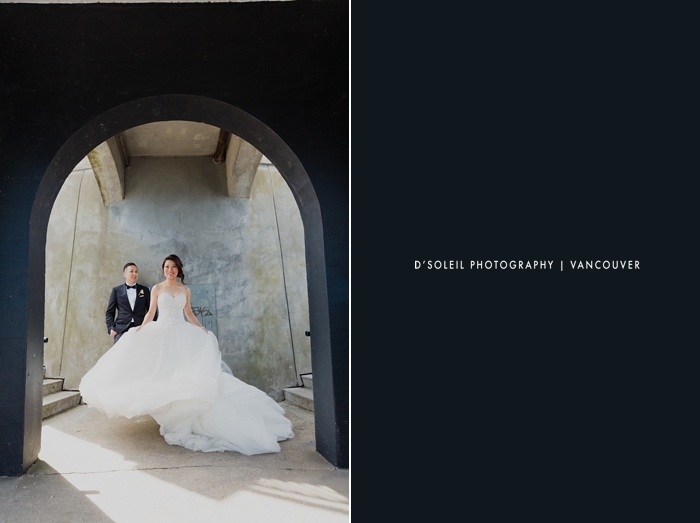 Brides who are looking for a ball gown silhouette should check Papilio Boutique!